REQUIRES 20 AMP SERVICE - 110 VOLTS. DO NOT USE MORE THAN 50' OF #12 EXT CORD. 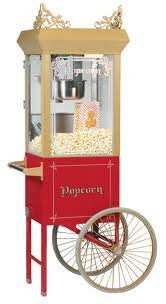 * Please call us for any questions on our machine popcorn w/cart rentals in Haverhill MA, serving Massachusetts and New Hampshire.